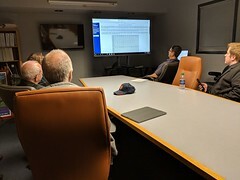 The first meeting of the 2018-2019 year took place at the National Weather Service office in Flowood. 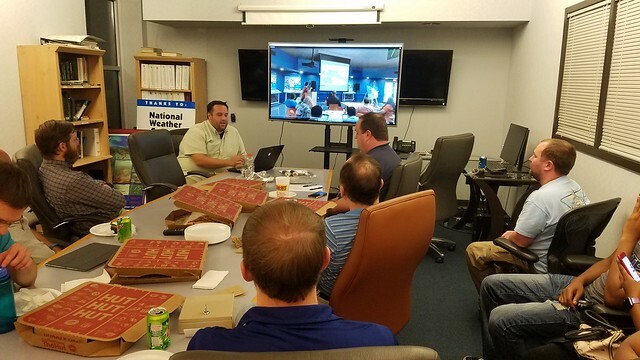 The first meeting of the 2018-2019 AMS/NWA chapter occurred on September 20, 2018 at the National Weather Service Forecast Office in Flowood, MS. The meeting was called to order at 7:15pm by President Eric Carpenter. Recording Secretary Joanne Culin took note of the number present. There were 18 attendees present. A roll sheet was passed around, which also indicated those whose dues were lapsed or not. Recording Secretary Joanne Culin summarized the meeting from last spring for the group. The amount in the treasury was $364.29 as of the start of the meeting. A total of $54 was spent on pizza for the meeting and was reimbursed to Will Day. 3 members paid dues ($60) bringing the total in treasury to $370.29 at the end of the meeting. Daniel Lamb addressed the group about finalizing changing our chapter name with AMS, which apparently was never done. They need a petition that is signed by several national AMS members, so that was requested from a few who volunteered to sign the petition. Eric asked for ideas for meetings for this upcoming year. Dave Roberts offered the chapter to come to WLBT. That may be something that is done in October. 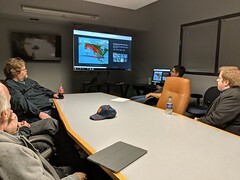 The guest speaker for this meeting was Taylor Pechacek, a recent Pathways Student Intern at the NWS office in Pago Pago, American Samoa and current volunteer for NWS Jackson. Taylor presented on his experience this summer in Pago Pago, where he was for 10 weeks. He told us about the geography of Pago Pago and how American Samoa is about 6200 miles from the United States. He mentioned that many people there live in communal situations and that privacy is a commodity. The population is about 51,000 people and there are two seasons: wet season(November-April) and dry season (May-October). 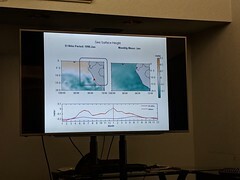 While there, Taylor worked on a project studying the long term sounding climatology of Precipitable Water and Showalter Indices. He also showed video and pictures of the culture of the region. Canned food is very popular there, and like in Hawaii, Spam is eaten regularly. He brought spam sushi for us to try. He basically then just answered any questions we had. He said 65 degrees was the lowest temperature he saw there. Satellite phone calls were ten dollars a minute. They launch weather balloons at Pago Pago, but with the time difference, it is actually at midnight and noon. There is no radar coverage there, only satellite. On the way back from Pago Pago, Taylor stayed in Hawaii for about a week. There, he got to go out on a hurricane hunter mission into category 4 Hurricane Lane. He showed videos and pictures from this experience. He also go to release a dropsonde. The meeting concluded at 8:45pm, and it was adjourned. Taylor talks to the group about his time in American Samoa.